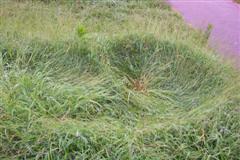 The aliens must recognize now that we have a real farm, as some wee ones came by the other night and made crop circles. They were small, about 10 feet across, and there were five of them. Amazingly, none of the crops were harmed during the making of the circles. Those wacky aliens!